GREAT LOCATION!! SIMILAR TO AN HOTEL WITH A CASUAL CONTEMPORARY DECOR. This building, Menesses THE CITY, is located in the Central/North area of Playa del Carmen on Constituyentes Avenue just steps from the famous Fifth Avenue and a short walk to the beach access. Fresh fruit smoothies and the best huevos rancheros in town are right around the corner…can you taste the goodness already? BEDROOMS: Enjoy affordable brand new 1 bedroom, 1 bath accommodations, convenience, security and style all in one. The main bedroom has 1 KING BED , safety box for your convenience, closets and Flat Tv with cable . PARKING: Underground Parking Lot accesible remotely. Train yourself at the Gym, Take a relax at the Spa and delight yourself with a good movie at the Cinema room while your kids are playing at the Kids Club. The Kids Club is intended for parents that are visiting to have some time out in Playa. Also you can rent this apartment per month. CONCIERGE SERVICES UPON ARRIVAL AND THROUGH OUT THE STAY, JUST CALL OR EMAIL TO: . We were very satisfied with our upgrade to Menesse. Reasonnably wheelchair accessible, loved the heated pool. Everything is at walking distance, located in front of a big grocery store. Hola Louis, thank you for your evaluation! we are happy to read such a nice review of your stay with us. Our apartments are kept maintained to guarantee the confort of our guests and to meet all requirements they need to feel as at home. The unit you choose especially ith the perfect location to enjoy the downton at a walking distance to the turquoise water of the sea. We hope we get the chance to host you again in Playa! Best regards from Playa Moments' staff. Stayed at Menesse The City for 10 days. The one bedroom condo was perfect for us. It is across the street from the grocery store and about a 15 minute walk to the beach. The block is newer and our condo reflected. It was clean and modern. Two pools. 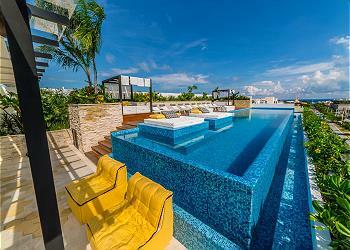 The roof top pool could use additional shade as it is very hot. Staff is the lobby were very helpful. Would stay there again.